Do you like this effort to Save Los Angeles Freeway Murals? CLICK NOW on the THUMBS UP! 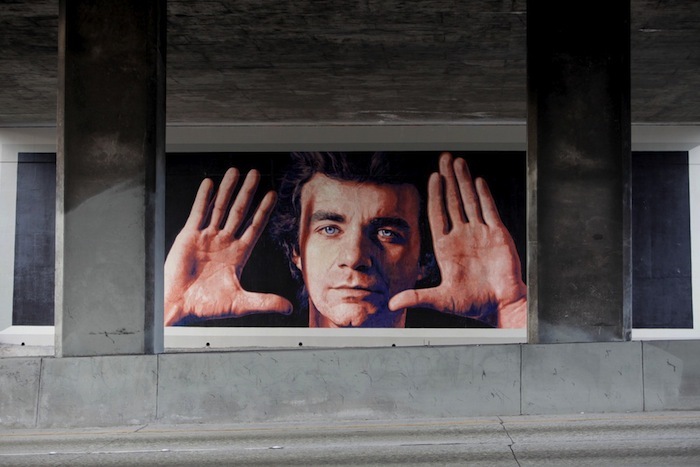 In 1984, Kent Twitchell, Los Angeles’ most famous and most visible mural artist, was part of an elite group of artists to paint for the City of Los Angeles a series of murals along the downtown freeways to celebrate the Olympics. His “7th Street Altarpiece” composition uniquely consisted of two murals, one on each side of the 101 freeway under the Grand Ave. overpass. It was genius. Over the years, these two murals, The “Jim Morphesis Monument” and “Lita Albuquerque”, have unmercifully been tagged by graffiti vandals, disrespecting the artwork and the community that celebrated. Several attempts have been made to restore them but a lack of commitment to their maintenance relegated them back to a visual expression of anarchy. Recently, The Mural Conservancy of Los Angeles committed to maintain these murals and Fine Art Conservation Laboratories (FACL, Inc.) was chosen. 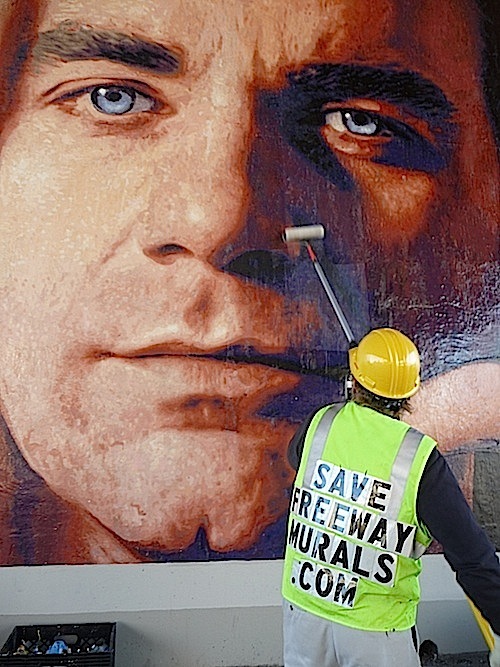 So the mural restoration was undertaken and this page shows you all the interesting details of reclaiming Los Angeles public art from the graffiti; the Jim Morphesis Monument by Kent Twitchell has been fully restored (see photo above). 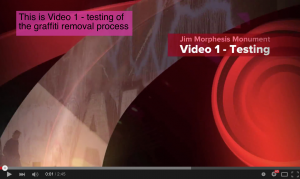 Video 1 – The testing of Kent’s original artwork to see IF it could be cleaned safely. Video 2- Graffiti removal and the unveiling of the original mural once again to be enjoyed by the millions who drive by. Video 3- Fine tuning the cleaning, retouching to help the mural looks it best and the process of protecting the mural from future graffiti. Before starting to remove the graffiti from the murals, we had to do tests to see if the process would hurt/damage the paint. Here’s a quick video of our testing process. 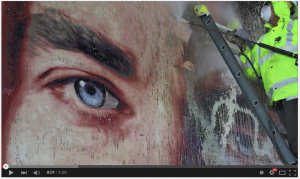 Here is the short video showing the graffiti removal and the long awaited return to daylight of the fantastic mural by Kent Twitchell. So, now the mural is cleaned of the graffiti “mask.” But you may have noticed that the mural wasn’t quite up to gorgeous. This was mostly because the graffiti paint remover works best in warmer weather and the day we worked it was 60 degs. So, we were left with a follow up fine tuning cleaning, we decided to repaint the background as per the artist’s wishes, we needed to do some touch up and we wanted to put another thick layer of varnish to protect against graffiti in the future. All this work began the week after Thanksgiving. By the way, thanks for all the honking and waving as you drive by. Its great to see the community support. The final fine tuning, touch up and varnish really made the mural look fantastic. Here’s the quick video made by us just so you would be entertained! So, is it useless to try and protect murals from graffiti vandals? Laura: I love that piece, and it breaks my heart when it gets tagged. Mario: great piece when its not tagged, question is, when isn’t it? Mario: as a long time resident of LA I would guess that in the last 15 years or so this and other murals have spent more tagged up than not, I remember when this wasn’t the case, sadly the tagging quickly turns some of these beautiful murals into huge eyesores that some of us are subjected to on a daily basis.. good luck with maintaining the mural, unless your planning to occupy the site, you’ll need it.. btw, how many more strategically placed murals could be painted with all of the money spent on restoring those that are poorly located? A close friend expressed his frustration that more is spent every time his mural is restored than he was paid to paint it… really? Kent Twitchell Some people have given up (with the idea of having murals in our community and keeping them nice). Some others haven’t. Scott M. Haskins: Mario, maintenance is the key. If a mural gets tagged Caltrans requires that the graffiti get removed (or painted out with their gray paint) within 10 days or even 48 hours if the tagging is obscene. We are planning to remove any tagging within 48 hours of the tag occurring… but that depends also on if we are notified right away. Small graffiti initials/name can be removed for a couple of hundred dollars. A tag that is more thickly applied and bigger, maybe a few hundred. An enormous repainting type of graffiti can still be /removed for, lets say, maybe about $1,500- $2,000… hardly the cost or payment for painting a mural. The key to a maintenance program working is to be organized, follow through, the coordination of, Caltrans, Public Works and about 4 other entities… and of course, there has to be funding… which there is. Finally, consider other nice things you appreciate. They often require maintenance/upkeep over a continued basis. Leave a THUMBS UP… a comment? I’m asked every once in awhile, “Who is Jim Morphesis? Media or art conservation questions? Do you think saving the Los Angeles freeway murals is a good idea? Click on THUMBS UP!… and leave a comment! What a wonderful job you all did.Thanks for bringing back the artistic landscape of Los Angeles. I am a real lover of this art and this artist. Keep up the good work. Thanks for writing about kent’s murals. He so great. His work has GOT to be protected and preserved. Good work. I am ecstatic about how amazingly the restoration of “Jim Morphesis Monument” is coming along. I am delighted Senator Kevin De Leon helped MCLA halt the whitewashing of LA’s 1984 Olympic murals and that we were able to say “thank you” the very day the restoration began! Love it. We are in the middle of the concepts of “graffiti” and “vandalism” finally becoming clarified. For years too many have had that borderline either-or mentality and not seen the gray areas. Spray graffiti or any other marks on another person’s property is, and has always been, vandalism. They can go ahead and call it art if they like but it’s still vandalism. The people who defend it because it is art miss the point. They would only understand if a “vandal artist” sprayed all over the hood of their new car. Oh, it’s OK. It’s art. Don’t get excited. LOL… that’s funny Lynnette. I’ve never thought of that but I’ve always thought of graffiti vandals as anarchists. So, I guess you are right… but, they’ll probably convert. There is nothing better than to have your artwork in the hands of a real Expert Like Mr. Scott Haskins. His experience is well known in the States as well as in Europe !!!~!!! It is so good to see the murals restored! Great job to all involved!! I hope the general public will be encouraged to call the police if they see future tagging taking place. Most of these murals are being viewed constantly by someone and everyone has a cell phone to report tagging. We can only hope that people will want to help! Again – great job!!! Ho visto che hai pubblicato un bel intervento su una facciata a LAX, ti informo che anche noi da un paio di anni lavoriamo su corda, appesi in pareti con attrezzatura alpinistica. Ti allego una foto di un lavoro che abbiamo finito questa estate su una torre medioevale sul lago di Garda. se mai ti dovesse capitare di aver bisogno di una squadra di restauratori aplinisti, noi ci siamo. WOW! 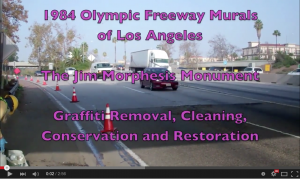 I just watched the videos you made about the restoration of the Jim Morphesis mural! A HUGE thank you to the professional talents of the FACL team, the City of Los Angeles, and Caltrans for bringing back the beauty of our city’s artwork and restoring some of the pride that is L.A.! WE LOVE L.A.! THANK YOU! Grazie per i complimenti per il lavoro con il video. E’ un sogno non realizzabile di pensare che basta mettere un video su YouTube e i soldi arriveranno. Ci vuole molto di piu’ ed e’ molto piu’ complicato di quanto pensassi. Quando ci troviamo la prossima volta, sono sempre felice di mostrarti qualcosa della produzione dei video. Ciao Scott, ho visto il video. Proprio oggi parlavo con lo storico che ci confeziona CD promozionali di lavori di restauro e ci domandavamo se l’idea di visualizzarli su YouTube potrebbe far parte della ricerca per fondi per la realizzazione dei restauri? Forse si sogna o forse è un può ingenuo? In italia c’è molta chiusura all’ uso di questo mezzo in questo settore ma mi son detta, perchè no? Quello che fai mi piace molto, non solo il lavoro qualitativo di restauro che fate ma anche la tua capacità di servirti delle nuove tecnologie. Mi piacerebbe poter imparare un po anche da te perchè mi sembra che ormai hai acquisito una padronanza del mezzo. At the end when we see the “before” and “after” shots…the work preformed is truely astonishing! This is really what this city needs at this time, I’m sure the majority of citizens thought the vandals had won the battle of the walls. But as long as there are artists willing to go toe to toe with them, it is not. Let’s all contribute to this effort to clean up this town if not with a broom or paint brush, then with $5 or $10 dollars, about the price of a box of corn flakes. What a privilege it is to be part of such an exceptional team! These murals are part of the cultural heritage of Los Angeles, their restoration and rebirth is greatly appreciated by the people who admire them daily as part of their urban landscape. Thank you Kent and MCLA on getting the ball rolling, and thank you Scott for your amazing ability to problem solve, and put together everything it takes to succeed in a professional and timely manner (with a spectacular outcome!). AMAZING! The before and after of this mural is magical. Great job! Now lets get moving on the next ones! Los Angeles deserves to see the marvelous art work that has been painting over the years by brilliant artists, such as Kent Twitchell. Lets brighten LA’s eyes to the wonderful world of ART!! I have nothing but gratefulness for you and the FACL team. What a wonderful job you all did, the mural looks stunning! I never hoped that the mural could look this amazing! You’ve done a fantastic job with the restoration/conservation work. Thank you for being such a leader in the process and being such a quality professional.I am looking forward to keep on working with all of you to have LA regain its title as The Mural Capital of the World! Thanks for bringing back the artistic landscape of Los Angeles!!!!! Keep supporting mural restoration. HOW WONDERFUL! I knew this was a historic feat, but this is even better news. We are paving the way for Artistic Preservation and Respect. GREAT WORK! Nice videos…I’ve posted a link to this page a few places. Very proud and honored to be associated with this project. Love working with you. Thank you, Scott! Scott, I never dreamed or hoped that my mural could look so amazing after all its been through. You, Virginia and the others of your team have worked well with Caltrans to make this a wonderful project. Thank you and I look forward to working with you on other projects.